9'' x 24 inch pieces. 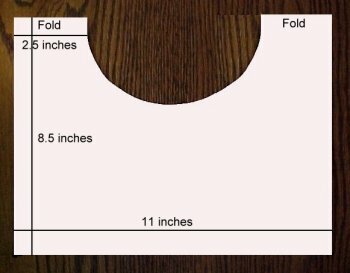 Fold 9'' x 24'' piece of paper to form a 9'' x 12'' piece. Place pattern on paper. Outline and cut. Punch holes as shown. Add reinforcements and yarn. Tie in front. 9'' x 12'' piece of construction paper. Cut out triangles. Add reinforcements. Punch holes for ties. Add ties. Overlap A on B and staple. Bring edge C down over A and B and staple again to form cap. 12'' x 18'' piece of construction paper. 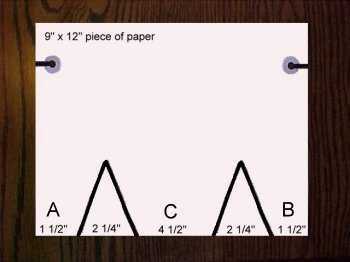 Make pattern on card stock for students to use. 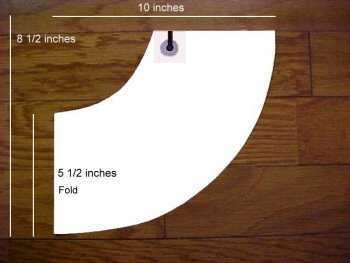 Fold construction paper in half. Trace around pattern. Cut out neck. Make outline of hat on black paper. Have students cut out hat. 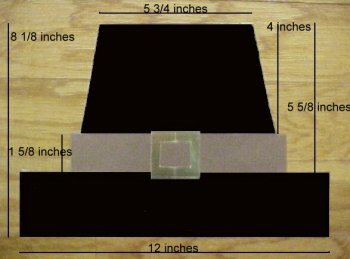 Provide strip of brown pre-cut paper for band and pre-cut buckle. Glue parts together and staple hat to black pre-cut head band.